Michael L. Benson is Professor of Criminal Justice at the University of Cincinnati. He is a past President of the White-Collar Crime Research Consortium. In addition to numerous journal articles on white-collar crime, he co-authored Combating Corporate Crime: Local Prosecutors at Work, which received the 2000 Outstanding Scholarship Award of the Crime and Delinquency Division of the Society for the Study of Social Problems. Sally S. Simpson is Professor and Chair of the Department of Criminology and Criminal Justice at the University of Maryland, College Park. She currently serves as Chair of the Crime, Law, and Deviance Section of the American Sociological Association. 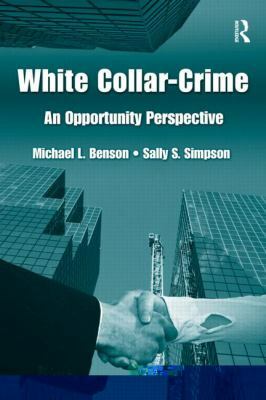 She is past President of the White-Collar Crime Research Consortium, and a recipient of the Herbert Bloch Award from the American Society of Criminology.Simpson, Sally is the author of 'White Collar Crime: An Opportunity Perspective', published 2009 under ISBN 9780415956642 and ISBN 0415956641.